It's a dog-sitting/walking weekend, and this morning was just beautiful...a crisp 54 degrees and sunny. Nikka and I walked (actually, she jumps a lot and tries to pull the leash out of my hand...teething, I think) around the neighborhood admiring the beauty of the last blooms of the season. 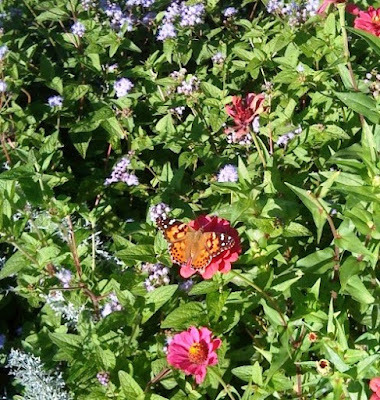 The Monarch butterfly seemed undisturbed by our intrusion. 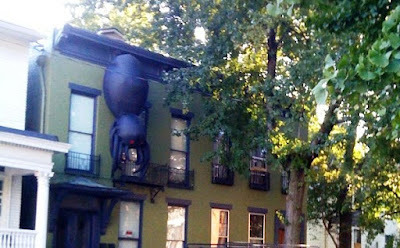 This great spider is anchored atop an apartment house a few blocks from home. The swish of the spider was kind of scary sounding...this picture just doesn't do it justice. Big plans for some fall cleaning today...a little furniture re-arrangement, window washing, and maybe a little mixed lettuce planting. I love autumn! I too love the autumn but it is a steaming 99 degrees in deep south Texas. It so hot where I live that I could have easily been convinced to wear a leash and take a walk in Nikka's place...LOL. Spiders don't scare me but that one looks a little intimidating. Thanks for taking us on your walk. Your walk sounds refreshing and fun. Don't know about that giant spider, though. Autumn cleaning should be on my agenda; Instead, I'm blog hopping and loving it.